So, you want to learn how to fix racquet drop on the serve? Having a deep racquet drop is vital if you want to be able to hit fast serves with plenty of power. However, getting enough racquet drop is something a lot players really struggle with. It can be one of the trickier things for players to master. The reasons for this are numerous. It can sometimes be due to a lack of flexibility. Or another big reason why a player can’t seem to perform a good racquet drop is that they aren’t relaxing the arm properly. Tension leads to stiffness, which causes a poor racquet drop and limits the power and fluidity of the serve. Luckily for you, I’ve got an amazing serve drill that can really help you with your arm relaxation, and your racquet drop. 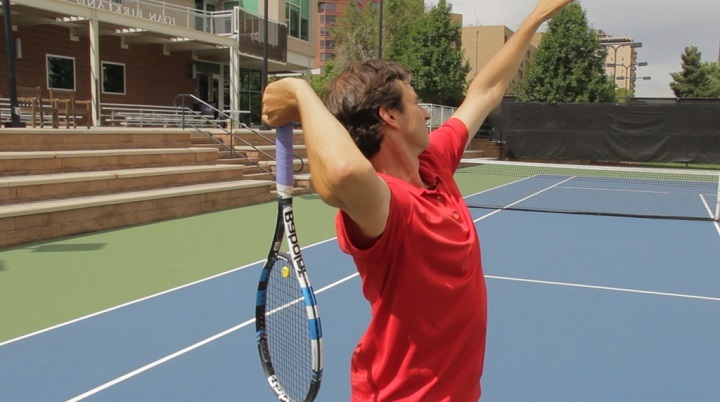 The continuous swing drill is one of the most powerful serve drills that you can do. You can perform this drill by swinging without tossing the ball, and letting your follow through come round, so that you can begin a new swing without stopping your arm. One serve motion leads directly into the next one. Hence the name, the “continuous swing” drill. You will develop better relaxation and rhythm when you perform this swing drill. In order to specifically improve your racquet drop with the continuous swing, try holding the racquet lower down on the grip. In other words, only hold onto the racquet with your index finger, middle finger, and thumb. Your ring finger and pinky will dangle off the bottom of the grip. This allows for more play in the racquet, and helps you feel what the head of the racquet is doing. 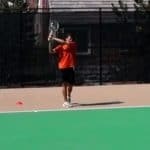 Perform continuous swings with your grip lower and really focus on feeling your racquet drop after the trophy position. 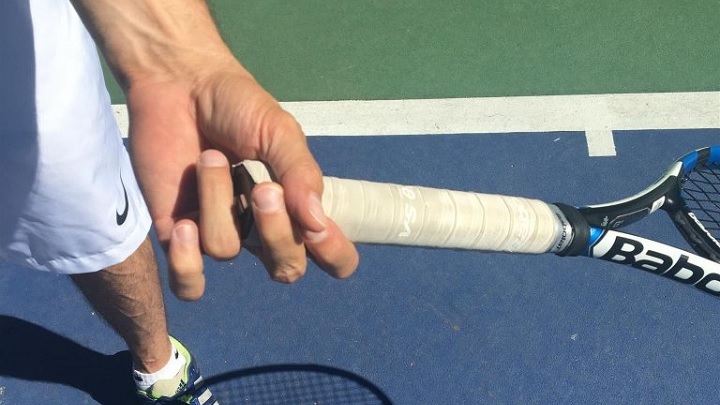 One of the main reasons players struggle with their racquet drop is that they have too much tension in their arm. In order to loosen up, don’t hit the ball into the court at first. Instead, turn around and hit into the back fence until you master the feeling. Players often get more tense, because they are trying hard to make their serve. 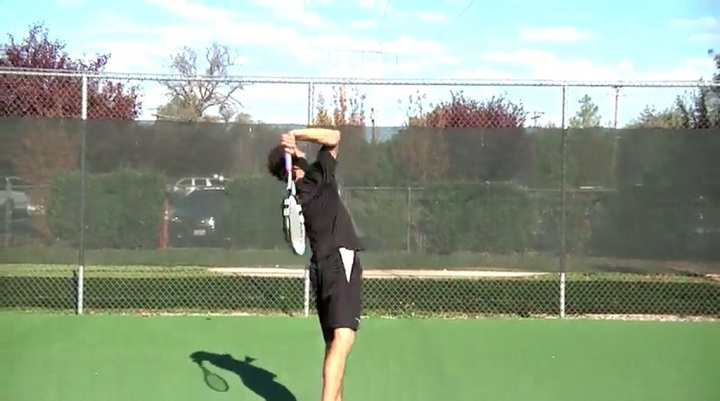 Hitting the serve into the back fence removes this pressure and lets you loosen up. Start by doing swings without the ball with hand low on the grip so that you can feel that nice racquet drop. Once you’re comfortable with that, add the ball back into the equation. Do one swing without hitting the ball and the next hitting the ball into the back fence. Make sure to focus on a relaxed racquet drop. 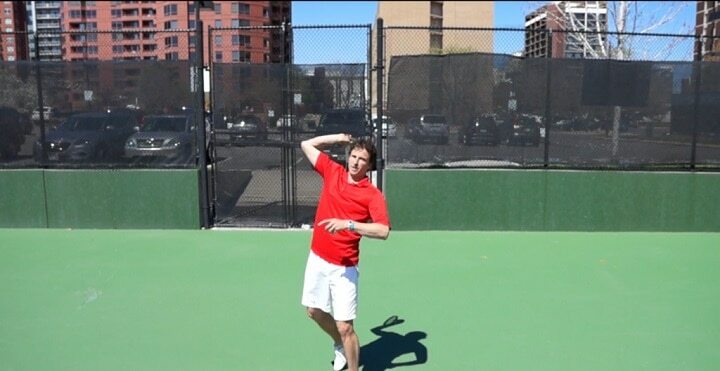 Then turn around and hit balls into the court with the same motion. One swing without hitting to get the feeling, and the next hitting the ball. Once you’ve got that down, you can try sliding your grip up a bit to its normal position, and see if you can reproduce the same relaxation with your normal grip. If you follow this progression you should quickly feel an immediate improvement in your ability to relax and in your racquet drop. 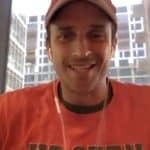 Federer Loses #1 Ranking…What’s next?